Can you name the location of this photo? Show off your skills and send us the right answer and the first correct respondent will receive two passes to any tour of your choice (History Coach, West End Walking Tour, Historic Bike Tour or Hotel Jerome). 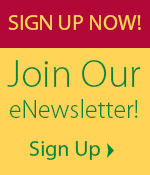 Send your suggestions to archives@aspenhistory.org. (You can click on the photo to make it larger). Last month, we didn’t have a winner! 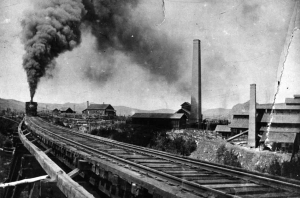 It turns out that this photo is an actual mystery, and we don’t actually know where it is. Do you? 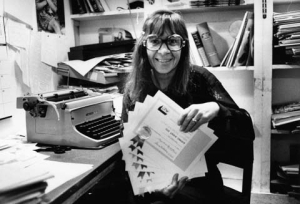 Longtime Aspenite and beloved journalist Mary Eshbaugh Hayes passed away on Thursday, Jan. 22. She is a lifetime trustee of the Aspen Historical Society and a dear friend. She was 86. Hayes moved to Aspen in 1952, joining the staff at the Aspen Times as a photographer and reporter. At a young age, she knew she wanted to report and take photographs. 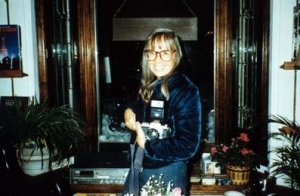 By age 17, she was a cub reporter at the Livingston County Reader in Geneseo, N.Y., before she attended Syracuse University, where she earned degrees in journalism and English. After a short stint in Denver, she moved to Aspen and soon after married Jim Hayes, an Aspenite renowned for his silversmith skills who died in 2012. Together, they had five children; she is survived by her daughters Jess Bates, Pauli Hayes, Elli Ford and Lauri Hayes; son Clayton; seven grandchildren; and a great grandson. She is the author of several popular books about Aspen, including “Aspen Potpourri,” a 50-year overview on the families and characters that make up this unique town. It’s in its fifth edition, it has printed more than 12,000 copies, according to the Aspen Daily News. In 1996, she published “The Story of Aspen” in collaboration with cartoonist Chris Cassatt. 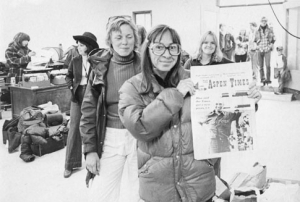 Though the former editor-in-chief and associate editor at the Aspen Times, Hayes is most recently known for her society column, “Around Aspen,” which ran in the Aspen Times Weekly for decades — and will continue through February as she planned photographs and stories through the month. 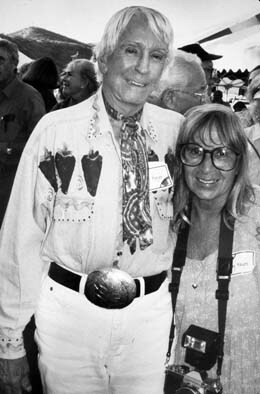 Hayes was a fixture on the Aspen social and community scene, always at events to take pictures and talk with the people attending. Thousands of her photos will be preserved in the Aspen Historical Society archives for future generations to enjoy. 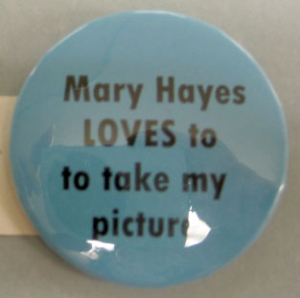 But, here we turn the camera on her to show off some of our favorite photos of Mary herself, all part of the Aspen Historical Society Collection. Mary Eshbaugh Hayes began using this Underwood typewriter when she first started at the Aspen Times in 1952. Verlin Ringle, the former owner of the Aspen Times, used it before Mary. She continued to use it until roughly 1990 when the Times modernized with computers. Mary donated the typewriter to the Aspen Historical Society in 2008. A slide of the Hayes Family, 1967. The image shows Jim and Mary Eshbaugh Hayes with their children; Pauli, Ellie, Laurie, Clayton and Bates. 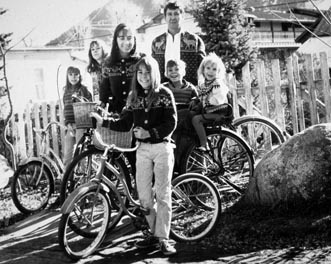 They are posed with bicycles in their backyard and are all wearing Nordic sweaters. A photo of Mary Eshbaugh Hayes with her camera at Explore Booksellers, 1980. 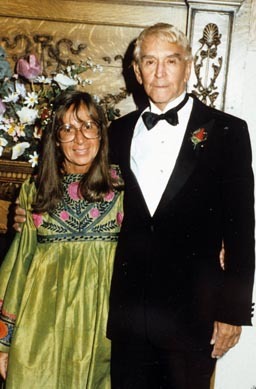 Mary Eshbaugh Hayes and her husband Jim Hayes at a Les Dames d’Aspen party, circa 1990. Jim and Mary Eshbaugh Hayes at an Aspen Times party, circa 1990. A button issued by the Aspen Times. 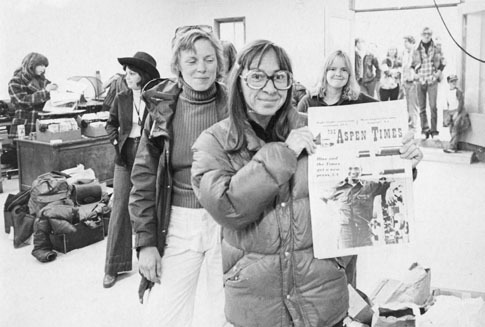 A photograph of Jill Sabella (left) and Mary Eshbaugh Hayes (right) in the press room of the Aspen Times, in which Mary is holding a photo of pressman Blue Neal on the front page from October 6, 1977. 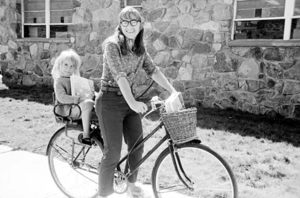 Mary Hayes on a bike, with her young daughter Jess Bates on the back. She is distributing her cookbook, “Aspen Potpouri”, September 1968. She is next to the Post Office on Spring Street. On more than one occasion, someone rode a horse into the Hotel Jerome’s J-Bar and straight through it. Gives new meaning to “Driving Under the Influence,” right? Urban legend also states that on one particularly rowdy night, at least three celebrities were “over-served” to the point that they all fell of their bar stools. Good thing the paparazzi weren’t around in those days. The J-Bar has served as the community’s unofficial gathering place and watering hole for more than a century. But, it’s just one of many bars in town that have seen decades of stories go down. Our new Historic Pub Tour literally walks through some of these establishments, giving guests a chance to learn about local lore and sample the preferred spirits. It leaves from the Red Onion every Thursday at 3:30 p.m., stopping at Justice Snow’s and the J-Bar afterward. Cost is $20, and that includes a small drink at each stop. Obviously, it’s for people ages 21 and over. 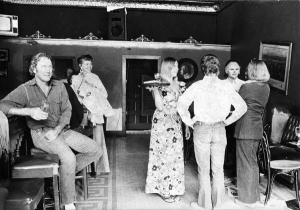 Ross Griffin sits on Hotel Jerome bar stool, while Ron Funk and several others talk to the waitress. The photograph was taken as part of an advertising campaign, showing the progress of remodeling in 1972 and was donated by Ann Hodges. Last month’s winner was Bryan May, who correctly identified the following as Loge Peak lift on Aspen Highlands in the ’60s.